Baryshnikov Arts Center presents Carmen de Lavallade in New York premiere of As I Remember It, at the Baryshnikov Arts Center, Jerome Robbins Theater, 450 West 37th Street in New York. This intimate portrait of dance icon and actress Carmen de Lavallade spans an unparalleled six-decade career working with luminaries Lena Horne, Harry Belafonte, Josephine Baker, Alvin Ailey, and many others. In the N.Y. Premiere of Ms. de Lavallade’s solo performance, poignant movement, film, and storytelling weave an unforgettable memoir about her venerable life on stage. As I remember It was developed in residence at BAC. This presentation of As I Remember It was made possible by the New England Foundation for the Arts’ National Dance Project. Generous support provided by Jeremy Smith. Carmen de Lavallade has had an unparalleled career in dance, theater, film and television beginning in her hometown of Los Angeles performing with the Lester Horton Dance Theater—the first multi-race dance troupe in the United States. She persuaded a neighborhood friend named Alvin Ailey to join her in studying with Horton. While in Los Angeles, Lena Horne introduced the then 17-year-old Ms. de Lavallade to filmmakers at 20th Century Fox, where she appeared in movies with Dorothy Dandridge and Harry Belafonte. 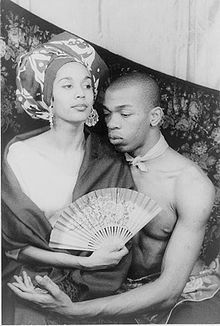 Geoffrey Holder with his wife Carmen De Lavallade. Ms. de Lavallade’s dance career includes ballets created for her by Lester Horton, Geoffrey Holder, Alvin Ailey, Glen Tetley, John Butler, and Agnes de Mille. She succeeded her cousin Janet Collins as the principal dancer with the Metropolitan Opera, becoming the second black dancer to perform on that stage, and was a guest artist with the American Ballet Theater. She has choreographed for the Dance Theatre of Harlem, Philadanco, the Alvin Ailey American Dance Theater, and productions of Porgy and Bess and Die Meistersinger at the Metropolitan Opera. 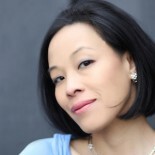 Ms. de Lavallade also has had an extensive acting career as a member of the Yale Repertory Theatre and the American Repertory Theatre at Harvard, performing in numerous off-Broadway productions, and serving as an instructor at the Yale School of Drama where she taught many up and coming “super stars,” including Meryl Streep and Henry Winkler. 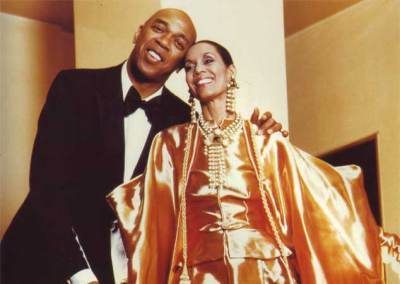 Ms. de Lavallade and her husband, the late Geoffrey Holder, were the subjects of the film Carmen & Geoffrey (2005). In 1954, Ms. de Lavallade made her Broadway debut partnered with Alvin Ailey in Truman Capote’s House of Flowers. Her most recent theatrical work includes Step-Mother by Ruby Dee (2009), Post Black by Regina Taylor (2011), and the Broadway revival of A Streetcar Named Desire (2012). In 1999, she was named one of America’s 100 Irreplaceable Dance Treasures by Dance Heritage Coalition. This entry was posted on December 13, 2014 by Lia Chang in African American Artists, Dance, Entertainment, New York and tagged 100 Irreplaceable Dance Treasures, A Streetcar Named Desire, Agnes de Mille, Alvin Ailey, American Ballet Theater, American Repertory Theatre, AS I REMEMBER IT, Backstage Pass with Lia Chang, Baryshnikov Arts Center, Carmen & Geoffrey, Carmen de Lavallade, Dance Theatre of Harlem, Die Meistersinger, Geoffrey Holder, Glen Tetley, John Butler, Lester Horton, Lia Chang, Metropolitan Opera), Philadanco, Porgy and Bess, Post Black, Regina Taylor, Ruby Dee, Step-Mother, the Alvin Ailey American Dance Theater, Yale Repertory Theatre, Yale School of Drama.